Babs outdid herself with the weekly Michigan Pic. If you click it for a fullsize view I believe you will be able to count the feathers. Looks like a real harbinger of spring to me. So then I got to thinking about what a satisfactory weekend it had been, braided with friends and small adventures, and I found myself humming gently. 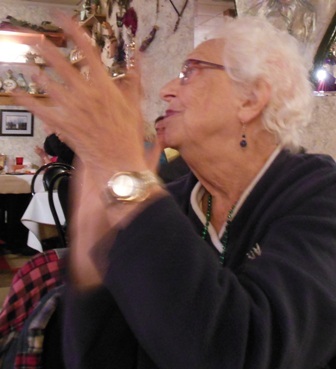 There was the Roundup Roadshow at Pearl’s in Elk Rapids, where Miss Betty Jo revealed a whole new side of her personality. Who knew that The Dean loved country music? There was breakfast at the Torch Lake Cafe with half the Township. (I wonder how long it will take us to start saying “I’ll meet you at TLC for breakfast”?) I was back there for dinner, too, along with neighbors Bruce and Karen Bigelow, who told me all the news from along Michigan Trail. I believe I have been living in a cave this winter. A nineteenth century cave at that. Good to get out and about. Good, too, to hear Leanna Collins singing. It turns out the Cafe has fine acoustics. On Sunday Bill Staines was at his finest at Sleder’s in Traverse City. Bill singing anywhere is a good time, but Bill at Sleder’s is a family reunion. An astonishing array of Northern Michigan music makers turn out every time. A person who might normally warble away during the singalong parts tends to hush up and listen to the harmonizing all around her, not to mention the excellent storytelling. No photos, as I was busy listening to my betters (Mary Anne Rivers, Louan, Patrick Niemisto, on and on, great waves of music). Bill’s website has some nice photos and much more. He says he’s drawn to “songs that are bigger than any one person who sings them.” It shows. I believe I will adopt that as my definition of a good story, too. Gotta go. Carol McCarus is headed north from Traverse City on her way to Charlevoix and we are going to meet at TLC. I like the sound of that. ← Breakfast at the Torch Lake Cafe Saturday – You come too. What a wonderful post! So happy to hear that the TLC is off to a good start. We saw Bill Staines here in East Lansing on Friday at the Ten Pound Fiddle and he had the whole place singing along – such fun! I think by springtime we all feel a little like bears coming out of our caves! Sounds like a wonderful weekend. Tell Babs that the “Three friends” shot is lovely. Bring on spring ! 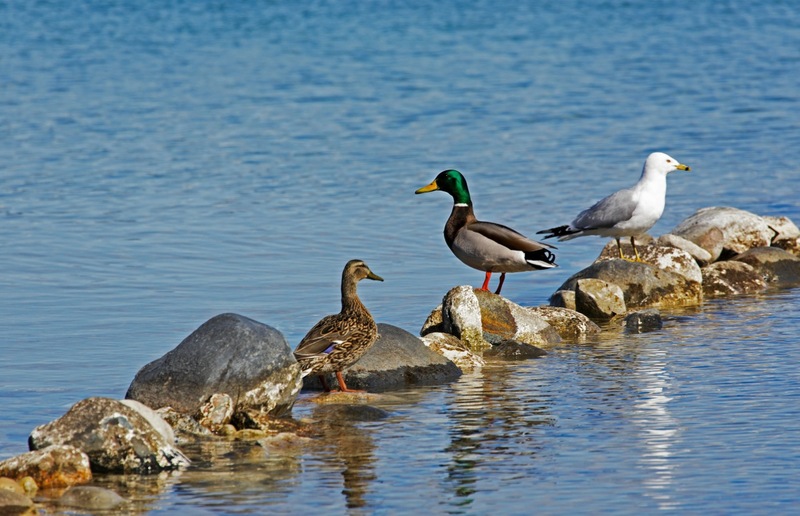 The three birds photo is so satisfying — the diagonal line of the rocks, the spacing of the birds, the central duck turned to the left, looking at something the others have turned their backs on. I also love the busy fingers of singer and musicians in the other photos. Plus the idea of meeting for breakfast at the TLC. Who knows? Maybe my sister and I will find a day to get over there come summer! Food, friends and music. Perfect. “braided with friends and small adventures.” – what a beautiful phrase! Lovely to hear you were in such good company and you enjoyed your weekend. Thanks to Babs for the beautiful feathery trio. Great picture. Can’t beat good food, good friends and good music and ducks! Love the red feet on Mr. Mallard. Glad you had a good weekend! 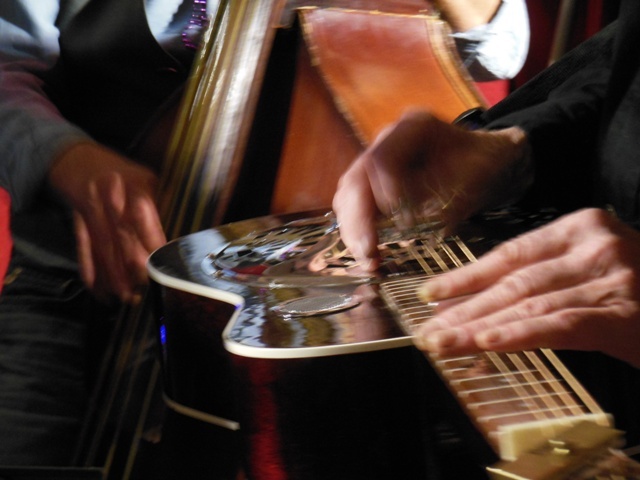 Ducks and dobro! What a combination. Both of them make me immensely happy when I run into them, though I confess ducks are around more than good dobro players. That’s a lovely photo of music appreciation personified, too. It sounds like there’s going to be plenty of TCL given and received this spring, some of it at the TLC. That’s good for everyone. Hurray for signs of spring! Babs did a lovely job with that photo. And Susan up above gives away another bit of information – I hope it was a good day for you. We are still reeling from the news in Boston, but I think it is still okay to be happy for the good things today.